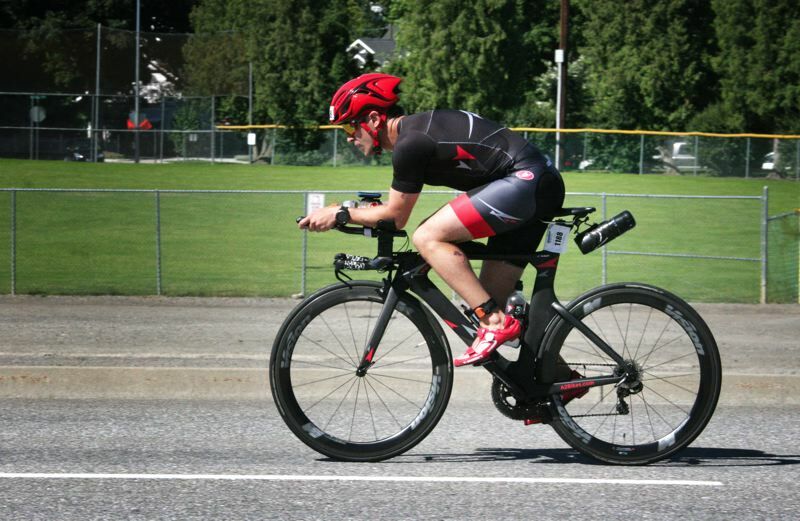 A Lake Oswego man set out to create a more affordable bike suitable for triathlons. AJ Alley, 31, of Lake Oswego signed up for his first triathlon several years ago as a way to "blow off steam" while studying for the bar exam. By no means a self-described runner, bicyclist, or even a swimmer, he dove into the swim/bike/run event and, for Alley, the rest was history. He was hooked and ready to upgrade from road bike to something more aerodynamic but balked at the price of the triathlon bikes at a local shop. With a small child at home, a mortgage and law school tuition, there was no way Alley could drop $3,000-plus on a new bike. But more importantly, he didn't believe they needed to cost that much. Thus began his quest for an affordable, yet competitive, entry-level triathlon bike. In the exploratory stages, Alley initially focused on the idea of building less expensive components, particularly aero bars — handlebar extensions that allow the rider to lean over the front wheel in a more aerodynamic position. But a week spent in Taiwan visiting a number of factories quickly led to the realization that the bare minimum just wouldn't make the cut; if he wanted to make triathlon bikes more financially accessible, he would have to jump in with both feet and create a whole new bike from scratch. "It was absolutely the right decision and I've had so much fun doing it," Alley said with a smile. His company, A-Squared Bikes, currently has one model available and, from where it stands stationary in his Tualatin office, its sleek geometry and wicked paint job exudes formidability. Aptly named the Speed Phreak, the economical triathlon bike features a stiff, carbon-fiber frame with bars that are airfoil-shaped — wide and flat, like an airplane wing — rather than cylindrical. For an entry-level bike, the Speed Phreak has a streamlined build throughout. Even though the bike only costs $1,899, "it looks like a ten thousand dollar bike," he said. This is important to a racers' confidence and performance, as Alley explains it, "When you get on a bike that looks like it fits with all the other bikes on the bike rack, it makes people feel better." So, how does he do it? To start, Alley said, he doesn't make nearly as much money as his competitors. He also sells his bikes direct to consumers through his online shop or at race events, primarily in Oregon. "The whole mission is to help expand the sport," Alley said. When race registrations alone are enough to discourage some athletes — ranging anywhere from $150 to $700 per event — Alley believes he can help people out by making the most expensive aspect of the sport more accessible. He likes to joke that his customers can save "two free race registrations" when buying the Speed Phreak. A-Squared Bikes was the official bike sponsor for the Ironman 70.3 Oceanside in California in April, and Alley now has three pro riders on his high-quality, low-cost bike. With 12 bicycles sold in less than a month since getting his first shipment back in June, A-Squared Bikes has already left the starting line in the dust.